April 7 – 9th Laura Aged 13. Our stay at Huxtable Farm was fantastic! Jackie gave us a warm welcome, where she had prepared hot buttery scones with jam and cream. Our room was cosy and the two dogs friendly. We got to cuddle and feed the lambs and we even saw one born. The walk around the farm was lovely and we got to paddle round on the boat on the pond. The restaurants round here are lovely and you can go down to the beach in Westward Ho! Thank you for the lovely stay. P.S. The little chicks were so cute and we got to see them hatch! April 25th Bernard, Suzanna & Naomi, Hereford. Huxtable Farm was a fantastic place to stay! Antony and Jackie were very friendly and they welcomed us with tea, coffee and cream teas! They showed us how to feed the lambs and we saw some 1 day old chicks. Our room was very spacious and the cleaning was great. On Easter Day we were given a bag of mini eggs each and the breakfast was delicious! Arlington Court is a great place to go on a sunny day and Woolacombe is also a lovely place to go with a HUGE beach and PERFECT for surfing. A walk along the coastal path by Heddon’s Mouth is well worth it with great views on a clear day. 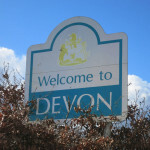 Also Coombe Martin and Ilfracombe are very nice. The Bell Pub in Chittlehampton is nice with a very friendly manager. Thank you Jackie & Antony for being so lovely and friendly all the time! 24th – 27th Sept Eddie & Sylvia ,West Sussex. 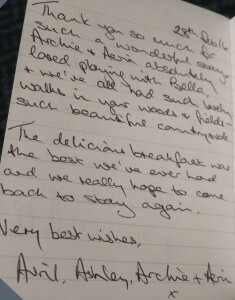 Thank you Anthony & Jackie for such a homely and comfortable stay. The extra touches were noticed and so much appreciated. The food and home comforts were of a high standard. 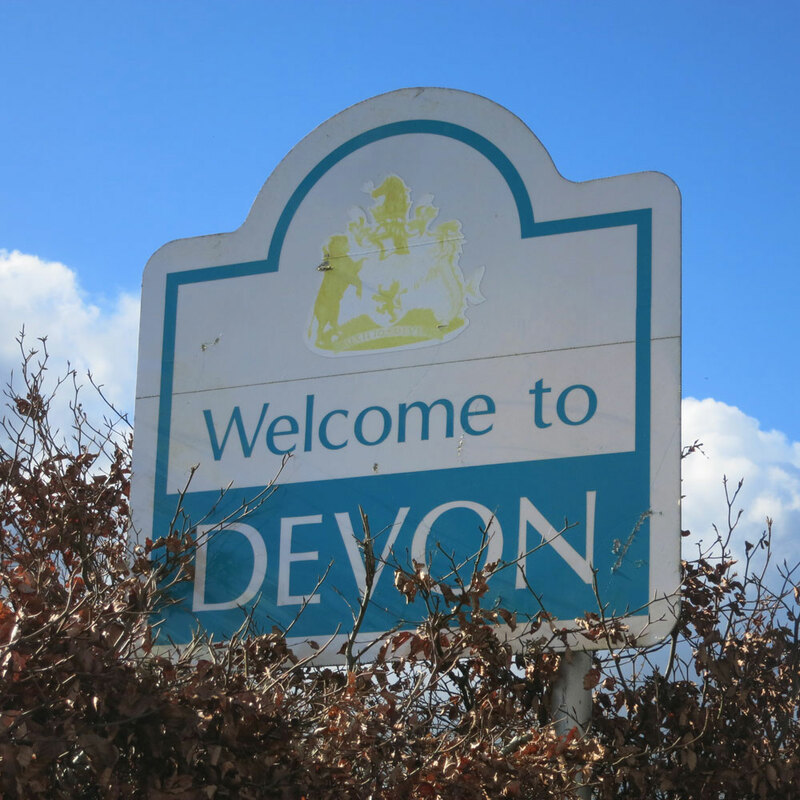 We even had some of the best weather of the summer which we fully exploited by visiting the local sights – surely Devon is the most beautiful county. We plan to visit again. 21st – 24th September Georgina & Peter, Norfolk. A most pleasurable stay in this beautiful farmhouse. Everything surpassed my expectations. Jackie & Anthony are so welcoming and friendly. Jackie’s gluten-free scones are to die for! Thank you so much. We will return! Sept 18th Gerry & Elizabeth, Canada. Thank you for sharing your beautiful and historic home. What a lovely memory to take back with us to Canada. The home cooking, preserves, baking were first class. Loved the friendly welcome from the dogs! Thank you for your wonderful hospitality. 2nd Sept Christine, Sydney, Australia. What a wonderful venue. I wanted to see “old-world” and that’s just what I got. 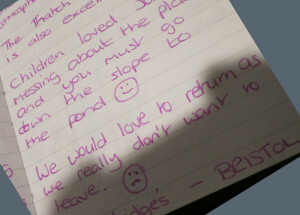 Lovely accommodation, food and scenery. I will talk about this experience for years to come. 20th August Ana & Ivan, London We had a wonderful time here, quiet and peaceful – just what we were looking for! We drove through Exmoor to Lynton & Lynmouth in early morning and it was amazing. Watersmeet was stunning! Thank you to Jackie & Antony for their hospitalityand the breakfast! Will recommend this place. 26th July Wendy, Richard, Samuel (10) and William (7) Warwickshire. Our 10th year visiting and 20th time here. The boys still want to come back next year!, if you’ll have us. Weather good – been to usual places ‘Big Sheep’, Putsborough Beach, ‘Squires’ Fish & chip shop, South Molton market, Clovelly & Quad biking at ‘Keypitts’ near Ilfracombe (expensive but worth it). Meals always the big plus and your patience with the boys. A big thanks again. 16 -18th May Stephanie & Roger, Berkshire. Thank you so very much for a lovely couple of days .You have been very thoughtful of our daughter and made our stay to celebrate my mothers 70th birthday , very relaxed and homely. It was great to feed the chickens, pick up the eggs and feed the lambs. 13th April Mandy, Stuart, Anna & David, Kent. 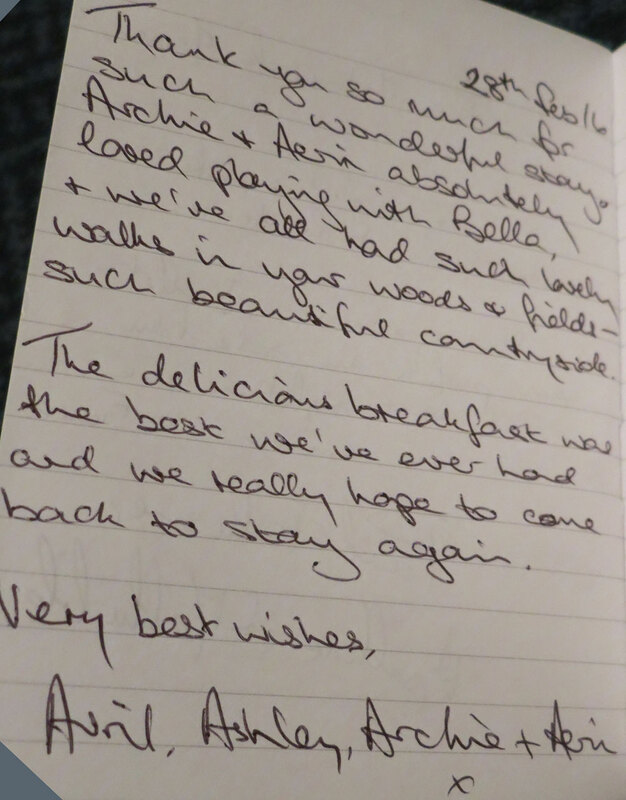 Thank you so much for a fantastic stay, you gave us such a warm and friendly welcome and the beautiful and comfortable rooms and exceptionally good food, we have had a fantastic time. We certainly want to come back and recommend you to friends. Playing with the dogs and feeding the lambs has been the highlight for the children. Seeing a lamb being born was amazing! Thank you both so much. 11th April Jae & Bran, Bath. The panoramic scenic beauty of this place is inspirational. 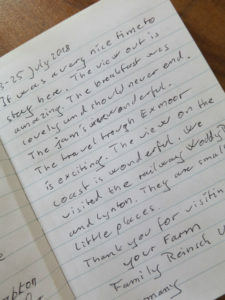 The farm is fantastic and Jackie & Antony friendly and welcoming. We only wish we could stay longer. 23rd March Rodney & Rosemary, Hampshire. Found in the Nationwide Bed & Breakfast guide. One of the best we have ever stayed in. 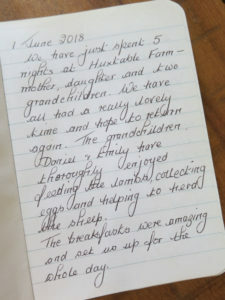 Excellent breakfast and the dinners are to be recommended – No need to eat out at all! Despite cold and rainy weather we enjoyed our full day break, visiting Clovelly, Porlock, Lynton/Lynmouth and exploring Exmoor by car. 23rd Feb Dawn & Ajun, Oxfordshire. Thank you so much for a wonderful break. What more could we have asked for a comfortable bed to rest our heads, good food (amazing breakfasts) and such friendly, warm hospitality. Thank you. A recommendation to friends is a must.